When you need an HVAC contractor in Palm Springs, you can’t beat a company with over 60 years of excellent service! All Desert Air Conditioning Inc’s HVAC (Heating Ventilation and Air Conditioning) contractors are experienced and certified. We only work with the best. That is how we have grown such a large base of word-of-mouth customers who only come to Desert Air Conditioning for all their heating and cooling system needs. We have been in the business for three generations now, and we know everything there is to know about heating and cooling, and we know Palm Springs! Knowing the area means knowing the specific demands that are put on heating and cooling systems. Desert Air Conditioning HVAC contractors understand those demands. We work with the best quality parts and know how to seal and equip you heating and cooling system for the Palm Springs weather. Our HVAC contractors in Palm Springs offer full service heating and cooling services. If you need maintenance and duct cleaning in order to keep your heating and cooling system working at top efficiency, we have the experience and knowhow to get the job done right. If you want to install a new heating or cooling system our HVAC contractors are experts on all the top brands to help you make the best selection for your home or business. If you need immediate repair on your current heating or cooling system, we’ve got you covered there as well. Palm Springs has both the extreme heat of the summer and the chilly winter nights to contend with. When your heating or cooling fails it can get more than uncomfortable—it can get dangerous! Some companies have wait times as long as a week before they can come make a repair. 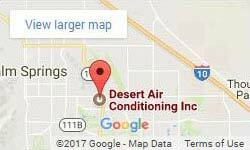 At Desert Air we have a warehouse of fully stocked parts and service vehicles that hold just about everything necessary for a heating and cooling repair. When you call our HVAC contractors for a routine maintenance, a replacement, or an installation, you know you are getting the best. Our North American Technician Excellence (NATE) certified specialists know what they are doing. They are able to get the job done right and done quickly. With us there is never messy poking around while we try to figure out what the problem is. We get straight to the heart of the problem. Our efficient work means lower labor costs. We also work with top quality parts with the highest warranties, keeping your interests in mind. At Desert Air all our transparent pricing is covered with you before we do the work. We only do work that you have approved and we are happy to answer any questions you may have at any point in the process. Our friendly, skilled HVAC contractors are the reason we have earned such a great reputation in Palm Springs. Call today.